Vineyard owner Lana Popham is running for Saanich council in the November municipal election. Popham, 39, owns the organic Barking Dog Vineyard on Old West Saanich Road and has been involved with numerous community issues and events. The most recent is her pitch to ban plastic bags in the capital region by end of 2008. She received a CFAX community award for her efforts. Popham is involved with several agricultural groups, including the Peninsula Agricultural Commission, the Island Organic Producers Association and even the compost committee at Brentwood Elementary School. 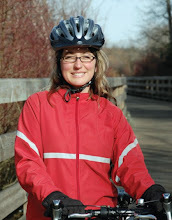 She's also a member of Saanich's planning, transportation and economic development committee. Saanich is at a "critical time" in its growth, and needs progressive choices about land use, transportation and sustainability, she says. More and improved green transportation choices are needed to reduce carbon emissions, says Popham. She wants to lobby for new investment in rapid transit, more bike lanes and trails, saying people won't leave their cars at home without good transit service. Popham is married to Jon, an Oak Bay firefighter. They have a nine-year-old son.